The tendency for people here to see the good in each other is overwhelmingly wonderful. Of course I'm sure there are exceptions, but from my experience here, and my many encounters with strangers, I have been pleasantly surprised by their trusting nature! For example, on Wednesday morning, I went to check out, but their VISA machine wasn't working, so I needed to pay all of my incidentals with cash. However, I had budgeted my trip to Tanzania quite well, so I had set aside cash for my taxi to the airport, and for my Kenyan visa upon entry into the country. Since I had to use this cash upon checking out, the receptionist assured me that there was an ATM at the airport, where I could withdraw money and pay the taxi driver upon arrival. This was not the first time a taxi driver willingly did this for us over the course of the trip, but I was still very thankful that he still accepted to take me. We arrived at the airport, only to find that the ATM was out of order. I was taken to the arrivals terminal through security to another ATM, which also happened to be out of cash. The driver then took me all the way into Stone Town, to the first ATM which was out of cash, and then finally to a fourth, which (thank God!) worked! We zipped over to the airport and I tipped him well before we said goodbye. I boarded the plane for the quick, 26 minute flight to Mombassa, where after a short stopover to clear customs and obtain visas, we were to fly onwards to Nairobi. About 10 minutes into the flight, the air hostess came to my seat and asked if I knew the Captain. I responded that I did not, but she told me that he thought I looked familiar. She told me to come to the cockpit with her, just to see if meeting him would jog my memory. I hesitated, but then followed her to the front of the plane. Inside the cockpit, the Captain and First Officer introduced themselves, and asked if I'd like to join them in the cockpit for the landing! The air hostess assured me that she'd watch my bags, and then proceeded to pull out a third seat, sitting me down and closing the door to the cockpit. It was SO COOL! 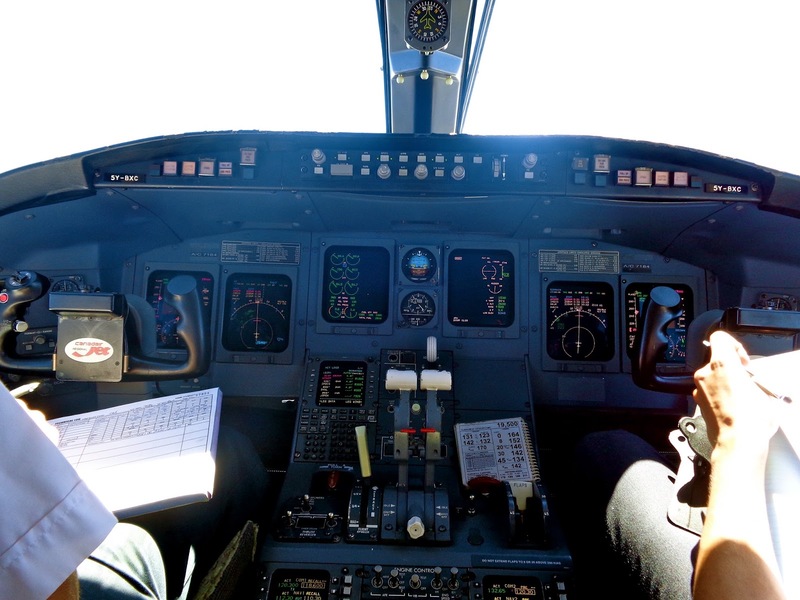 The Captain and First Officer were extremely nice, and explained to me the various internal processes of their plane, describing the functions of each of the button sets. They told me that they'd like me to join them for the second leg of the flight as well, so after our stopover in Mombassa, I was called in yet again to the front! It was absolutely beautiful up there, with the panoramic view, and the clear blue skies. 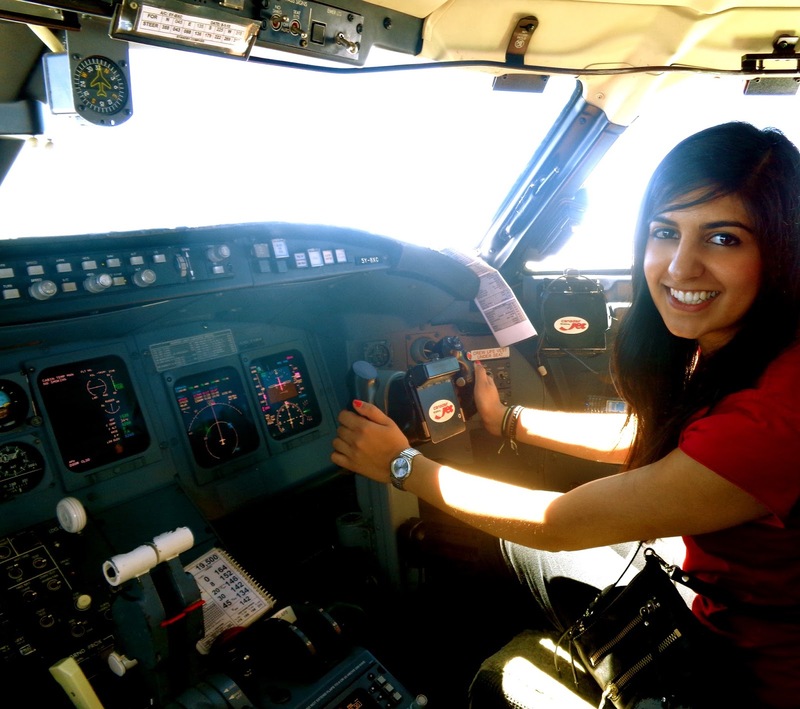 We chatted about their decisions to pursue flying as a career, their lives in Nairobi, and the reality of the very relaxed nature of flying a plane. Please note that I was SO excited to be sitting there. I was squealing silently in my head the entire time, trying to grasp the fact that I was hand picked to come sit in the cockpit, and that this was a pretty rare opportunity! To make the experience even cooler, when we were approaching Mount Kilimanjaro, the Captain offered to let me sit in the First Officer's seat for a picture! I couldn't believe it, and became extremely conscious of my hand movements, as I didn't want to accidentally push a button! I stayed in the cockpit for the duration of the flight, including the take-off and landing, and squealed out loud once we had all left the plane and I was out of hearing distance from anyone else. After collecting my broken luggage, I met Naziha's driver, Simon, and we went on our way to her home. Naziha is a really good friend of mine from Western, who is actually from Nairobi. She has graciously taken me into her home for the week, and I have been looking forward to arriving here for quite some time! Not only have I needed a break from the rush of the last few weeks travelling, but I've been feeling a bit homesick recently, and needed a "home-away-from-home." In addition, I've heard so much from my friends about Nairobi, that this visit has been a long time coming! From our "family" friend circle at Western, comprised of four Ismaili apartments in the same building, totalling 13 people, seven are actually from East Africa! So naturally, I have learnt much about their lives here, and I couldn't wait to experience it first hand. We have spent the week chilling, and it's been oh-SO-wonderful! Naziha's mom, dad and sister Jihan, have made me feel so at home, and have gone out of their way to make me feel a part of the family. I cannot express in words my gratitude! Every morning, we wake up to the table set with a pot of tea brewing. Most days we chill around the house, and then head to town for lunch or for coffee. On days that we stay home, Henry, their cook, prepares us a gourmet lunch, before starting the preparations for our afternoon tea and later on, dinner. Every meal has been absolutely delicious, and Henry always serves us with a huge smile on his face. In addition to the relaxing time I've spent here in Nairobi, I've also been fortunate to experience many new things. On Thursday, I experienced a Kenyan Ismaili funeral, as one of Naziha's friend's uncles had passed away. There were subtle differences from the way we conduct our funerals back home, but the prayers are of course the same. I started crying when one of the prayers commenced, as it is a hauntingly beautiful tune, and immediately transported me back to the funerals of my Nanabapa and Mama (my mom's father and mother) two years ago. I'm glad we woke up early to go though, as I know how important it is to support the families in large congregational prayer during their difficult time. 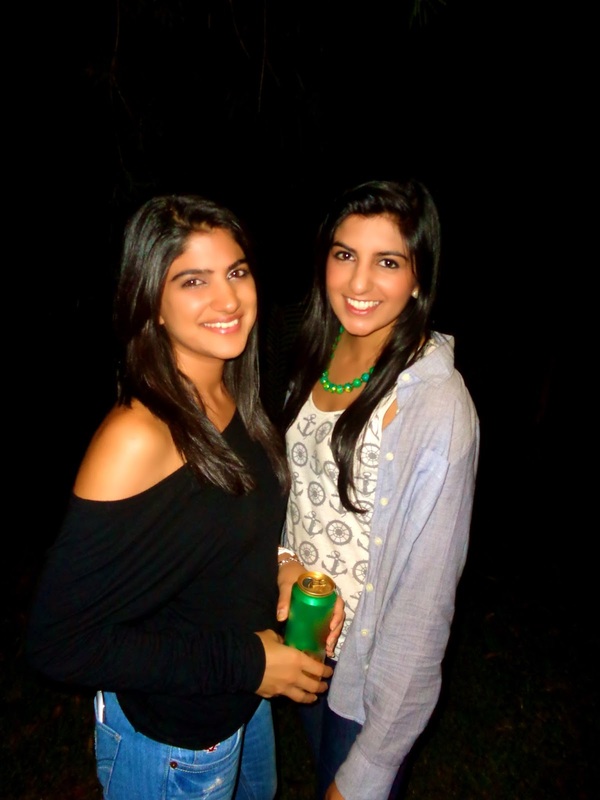 Thursday evening, Naziha and I went to one of her friend's homes, where they were having a barbeque. 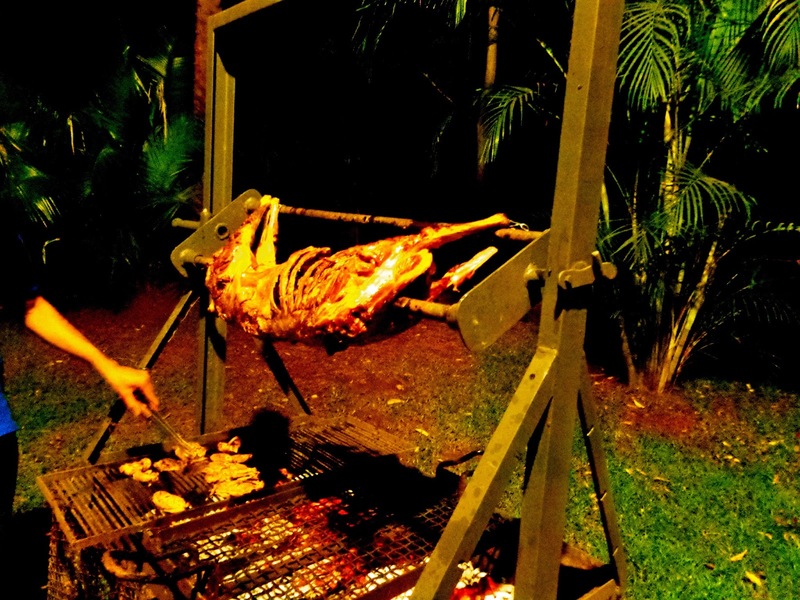 I became wide-eyed when I saw exactly what they were barbequing - it was an entire goat! I'm not kidding, they had purchased a headless goat earlier in the day from a butcher, and had cleaned it, before putting it on the spit! I could not believe my eyes, and they all had a kick out of my reaction. Most of them go to school in Canada, so they were playfully recalling their first Canadian BBQ experiences, when they showed up expecting fresh meats, only to find hamburgers and hot dogs! Although I was still in shock, I tried the goat as instructed, and it was delicious. Even more delicious was the freshly grilled lamb! It was really nice to spend time with all of them, especially as a couple of them actually started at Western this past year! So it was great catching up with them, meeting a bunch of their friends and seeing how they all live. One of them talked about taking me in his friend's helicopter up to see Masai Mara, and to have breakfast in one of the lodges out in reserve. I thought he was joking, but he was being quite serious, which illustrated to me how very different their lifestyle is! Overall, it was a great night, and I thoroughly enjoyed hanging out with Naziha's friend circle!